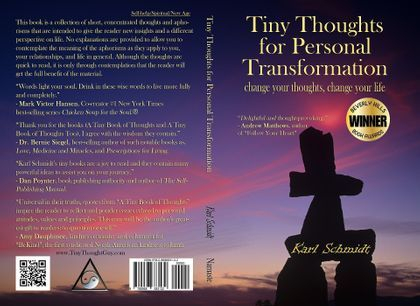 Book page for Tiny Thoughts for Personal Transformation: change your thoughts change your life. This book is a collection of short, concentrated thoughts and aphorisms that are intended to give the reader new insights and a different perspective on life. The thoughts and aphorisms were derived from personal meditations and experiences and some are accompanied by a small graphic to help the reader retain the information. No explanations are provided to allow you to contemplate the meaning of the aphorisms as they apply to you, your relationships, and life in general. Although the thoughts are quick to read, it is only through contemplation that the reader will get the full benefit of the material. - Dr. Bernie Siegel, best-selling author of such notable books as, Love, Medicine and Miracles, and Prescriptions for Living. - Dan Poynter, book publishing authority and author of The Self-Publishing Manual. - Amy Dauphinee, kindness crusader and columnist for “BeKind”, the first syndicated North American kindness column. - Peace Pilgrim II – renown peace advocate and author of Enjoying the Journey.